VPA alumni who will be speaking during “Chance Encounters” are, from top left: Kristine Deer, Rachel Frost, Brent Barbano, Terrance Smith, Emilie Shapiro and Tadashi Matsuura. People are often presented with serendipitous moments that can shape the course of their professional careers. 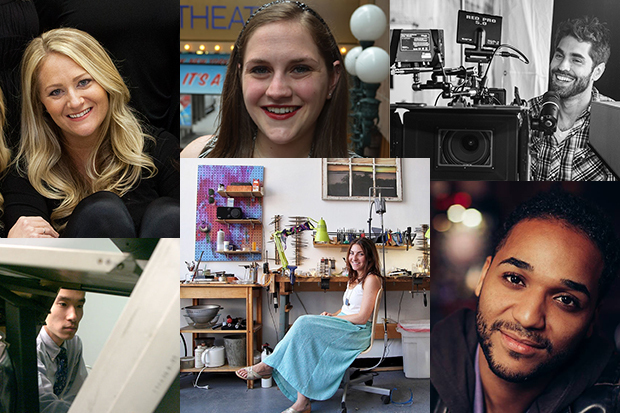 Six alumni from the College of Visual and Performing Arts (VPA) will share their compelling stories as they relate to this theme in “Chance Encounters: An Alumni Panel Discussion” on Friday, April 1, at 11 a.m. in Grant Auditorium on the third floor of the Falk College Complex. A reception will follow at noon. The panelists represent each of the six schools and departments in VPA. The discussion will be moderated by Lynn Greenky, assistant professor in the Department of Communication and Rhetorical Studies. “Chance Encounters” is free and open to the Syracuse University community. It is co-presented by VPA and Syracuse University Career Services. For more information, contact Allison Kirsch, VPA special events coordinator, at aakirsch@syr.edu. Barbano, a graduate of the Department of Transmedia’s film program and a Syracuse native, is a freelance director of photography based in Los Angeles who specializes in narrative, commercial and documentary filmmaking. Working on everything from big-budgeted features to small docs and traveling the world, Barbano has earned a diverse experience in the entertainment industry. Some of his clients include ABC, A&E, Discovery Channel, Disney, ESPN, Food Network, Fox, HBO, History Channel, Honda, National Geographic, NBC, NFL Network, Pepsi, Tesla, Travel Channel and Vice. Additionally, he co-founded ShareGrid, a peer-to-peer community where verified filmmakers and creatives can rent gear and resources to each other with integrated insurance. Much like the Airbnb of production gear, ShareGrid is currently in Los Angeles and New York City with thousands of active members and more than $60 million in inventory. Deer, who majored in fashion design in the School of Design, is CEO and designer of K-DEER, a luxury activewear brand. K-DEER manufactures a full but concise collection of apparel in New Jersey with American fabric printed locally. The company has approximately 170 accounts (yoga and fitness studios) worldwide and sells to major niche online retailers and specialty stores. The K-DEER team includes Deer’s sister Trine ’01, also a VPA alumna, who is the print designer and creative director. K-DEER has been featured in magazines and on celebrities, and it has a cult following by those who appreciate its commitment to giving back through its signature stripe collection. Since 2012, Frost has worked at Proscenium, a live events production company in New York City, where she worked her way up from creative associate to project coordinator to her current position as associate producer. She handles all elements of production, including travel logistics, graphics, managing talent and even organizing beach balls. She has worked on more than 20 live events, including three tours. She has worked with such brands as T-Mobile, Walmart, IBM, the UPS Store, Harley-Davidson, Ortho Clinical Diagnostics, Daiichi Sankyo, Heineken and JetBlue. Frost is a graduate of the Department of Drama’s stage management program. Matsuura, who graduated from the Rose, Jules R. and Stanford S. Setnor School of Music’s music industry program, is senior audio video engineer at Philadelphia-based George Blood L.P., a leading provider of archival audio and moving image services, digitizing obsolete and deteriorating audio, video and film media. Matsuura frequently works alongside Blood in concert and studio recordings for such ensembles as the Philadelphia Orchestra, Philly Pops, Symphony in C, Temple University, Orchestra 2001, Piffaro and Network For New Music. In addition, Matsuura and Blood have worked on several Grammy-nominated recordings. Shapiro, who majored in jewelry and metalsmithing in the School of Art, is owner and designer of Emilie Shapiro Contemporary Metals. She also teaches jewelry workshops throughout New York City and is the author of “How to Create Your Own Jewelry Line” (Lark Books/Sterling Publishing, 2016). Shapiro uses the ancient craft of lost wax casting, which dates back to the Egyptians; she carves sculptural pieces into hard wax and casts them into metal. Rough gemstones are incorporated into her work as a celebration of the beauty of natural imperfection. All of her production and resources are kept as local as possible, and every piece is handmade in her studio in New York City. Smith is a media strategist/producer and educator. After graduating from the Department of Communication and Rhetorical Studies, he started his own entertainment company, Simply Terrance Productions, anchoring operations in Belgrade, Serbia, and Prishtina, Kosovo, where he conducted a two-year study on how artists developed resilience in post-war-torn regions. His findings were featured in National Geographic as well as his book “Inside These Walls,” written by collaborative partner Mackenzie Reiss ’12. In 2015, he premiered his first feature-length documentary “Scratching a Broken Record” in Eastern Europe. Smith’s speaking engagements have placed him on the silver screen, at roundtable discussions with foreign dignitaries, engaging audiences at TED events and sharing media strategies with professionals around the world.